CULTURAL historian and curator Keith Vincent Smith will host an excursion to James Squire’s Orchard at Kissing Point Putney this Saturday June 2 from 10am to 2pm as part of the Guringai Festival (now renamed Gai-Mariagal Festival). This FREE event focuses on Woollarawarre Bennelong’s last years at Kissing Point. Meet at Circular Quay at 10am for excursion by RiverCat ferry via the Parramatta River through Wangal and Wallumedegal territory and history, to the site at James Squire’s orchard at Kissing Point Putney where Bennelong spent his last years and was buried in 1813. Trip from Circular Quay to Kissing Point is one hour each way. RSVP June 1. 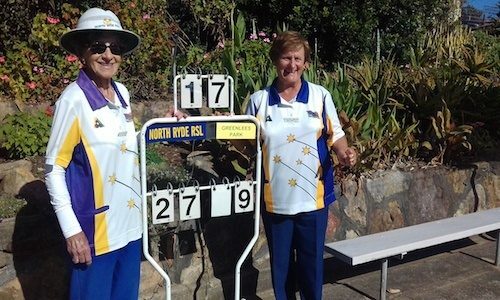 NORTH Ryde RSL lawn bowlers Pat Saunders (lead) and Slavica Beram (skip) proved triumphant at the recent Macquarie District Open Pairs championship at Brush Park. The talented duo claimed the title with an impressive and high quality 27-9 victory over Greenlees Park veterans Margaret Truesdale and Gladys Barnes. Pat and Slavica will now compete in the Region Play offs on July 10. North Ryde RSL WBC is definitely a bowling powerhouse with representatives lining up in two of the four Region play offs. Ella Brinch (viola) and Azumi Lehmann (harp) performing music by Ibert, Fauré, Debussy, Bizet, Puccini and Satie. Eastwood-Epping branch of Country Women’s Association meet next Tuesday June 5 in Eastwood Baptist Church hall, First Avenue, Eastwood from 9.45am. 6th: Victoria Ly. Thanks to all who supported the raffle. Visitors and new members welcome. Enquiries Jan 9871 2702. 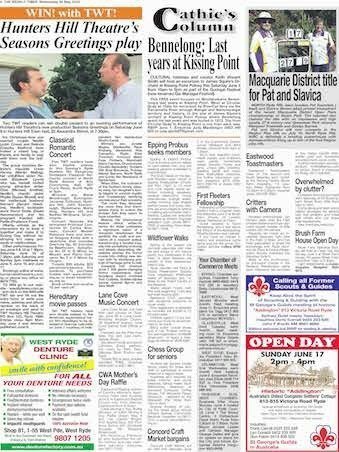 Epping & District Probus Club is a social club for retired or semi-retired men and are seeking persons interested in membership. The Club meets on the second Monday each month in Epping Presbyterian Church hall from 10am to 12 noon and runs regular social activities including speakers, musical afternoons, movie attendances, outings, walks, coffee morning teas, theatre performances and tours. Visitors are encouraged to attend a meeting and consider membership. Ladies are welcome to attend as visitors. Inquiries president Colin Jones 9871-2933 or secretary Ross Beattie 9871-1838. Spring is the season we normally associate with new life and colour in the natural world, but wildflowers in the Field of Mars Reserve are usually at their spectacular best in July. Ryde Hunters Hill Flora & Fauna Preservation Society have organised Wildflower walks on Saturday July 14. Meet at the Visitor Centre in the Reserve. Walks depart hourly with first walk beginning 11am and last walk leaving 2pm. Barbecue lunch provided with donations welcome to cover costs. Prior registration is essential as numbers are limited to 12 for each walk. Children aged 5-12 are welcome but must be accompanied by an adult. Bring water, closed shoes and a hat. Further information and registration: [email protected] or leave a message for Alfred on 9879 6067. Hunters Hill Seniors Chess Group caters for those who wish to participate in social chess on a regular basis. Expertise isn’t required for these informal and social sessions. Group meets each Wednesday afternoon at Ironwood Company Coffee House, 102 Woolwich Road, Woolwich – adjacent to the Woolwich Pier Hotel from 2pm to 5pm. Concord Craft Market will be held this Saturday June 2 in the Community Centre, corner Wellbank and Bent streets, Concord from 9am to 1.30pm. You’ll find beautiful handmade babies and children’s wear, plants, homemade cakes, biscuits, honey and jams, unique gifts, jewellery, greeting cards and more. New stallholders welcome. For further information contact Josephine 9772 0034; 0413 590716 or Adele 0422 9268567. Fellowship of First Fleeters – Eastern Farms Chapter meet this Saturday June 2 at Brush Farm House, 19 Lawson Street, Eastwood at 10am. Guest speaker is David Rosenberg, who’ll talk about the Ethics of Eavesdropping/ Whistle-blowers and Leakers. If you have an interest in history and adventure come along and join the group. Enquiries Jennifer Follers 9799 1161. 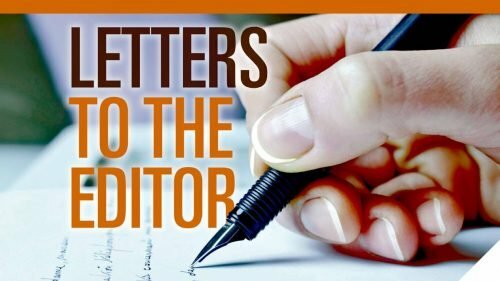 EASTWOOD: Meet second Monday each month. Next meeting June 11. Enquiries president Vic Tagg 0412 369 510 or secretary Steve Colquhoun 9874-0221. DRUMMOYNE: Meet first Wednesday each month. Next meeting June 6. Enquiries Secretary Alex Elliott 0438 774 323 or Vice President Paul Harcombe 0438 089 900. RIVERSIDE BUSINESS CHAMBER: Business After Hours Monday June 4 hosted by City of Ryde Council, Level 1 The Binary Centre, 3 Richardson Place North Ryde from 5.30pm to 7.30pm. Ryde Mayor Jerome Laxale and General Manager George Dedes will give an update on plans for the City and future. Enquiries Sabrina Ferguson 9952-8498. Eastwood Toastmasters meet on the second and fourth Saturday each month at the Training Centre, Brush Farm Academy, 19 Lawson Street Eastwood from 12.30pm to 2.30pm. Inquiries Jacky 043 206 2862. Amateur entomologist Ian Gordon often visits the Field of Mars Reserve and has captured superb images of little critters with his camera. Recently Ian made an incredible discovery right here in the Field of Mars, and has been persuaded to share his knowledge with Ryde Hunters Hill Flora & Fauna Preservation Society members this Saturday June 2. Meet at the Environmental Education Centre in the Reserve. Presentation starts 2pm. Afternoon tea provided at the Visitor Centre afterwards; gold coin donations are welcome to cover costs. Further information and registration: [email protected] or phone /leave a message for Phillip 0417 439 456. Clutterers Anonymous meet each Saturday at 52 Buckingham Street Surry Hills from 3pm to 4pm. Come along and learn some helpful strategies for dealing with this problem and meet with others who can share their experiences. Brush Farm Historical Society will hold an Open Day this Sunday June 3 at Brush Farm House, 19 Lawson Street, Eastwood from 10am to 3.30pm. Light refreshments available. Enquiries Margaret 9631 6872.